We’re not talking about big-corporation beer that comes out of huge vats in a 300,000-sq. ft. production plant. We’re talking about hand-made beer—not beer that is rushed through the brewing process to get it on the shelf as quickly as possible, but beer with enough personality and genuine taste to be called “craft-brewed.” This is beer made with pride by people who truly enjoy a quality, flavorful beer. Many of the invited brewers produce their beer for sale only in their location, whether it is a restaurant, a brewpub or a small brewery. Others are breweries large enough to distribute on a larger scale, but maintain excellent quality through their commitment to craft-brewing their product. You won’t find Anheuser-Busch, Coors, or Miller products here. What you will find are some truly remarkable beers that will tantalize your taste buds, beers that offer a variety of color and flavor that the big boys only dream of. But TAP New York is more than just about the beer. It’s about great food—tasty morsels that carefully complement these rich brews. And plenty of it. It’s about education ... about beer, about home-brewing, about beer/food pairings ... it’s about cooking demonstrations from some of the best chefs in the region (and beyond) ... and it’s about good friends coming together for a weekend of good beer, good food and good times. TAP New York is also a competition. 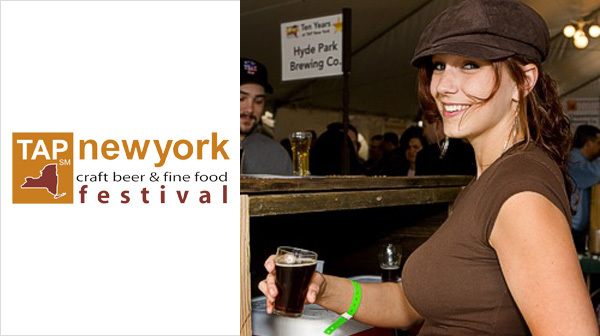 Beer experts and non-experts will judge in a competition for the Best Beer and Best Brewery in New York State. Two cups are awarded on Saturday, the Matthew Vassar Cup and the F. X. Matt Memorial Cup.